So yummy and doesn’t it look pretty? I think I got the table setting right. Week before- purchased all ingredients so no stressful holiday grocery shopping. Next time will get smaller turkey breast but leftovers never hurt anyone. Tuesday- Made cranberry relish- Wagner family classic very simple. In food processor or blender pulse cranberries, whole orange rind and all cut into chunks, 1/4 c sugar, 1/2 pecans/walnuts. You can make it without the nuts but it makes it healthier and cuts the sweetness. You can add more sugar if you like it sweeter. I made a big tub because it lasts forever and I love it. I actually used agave but you could use any sweetener. 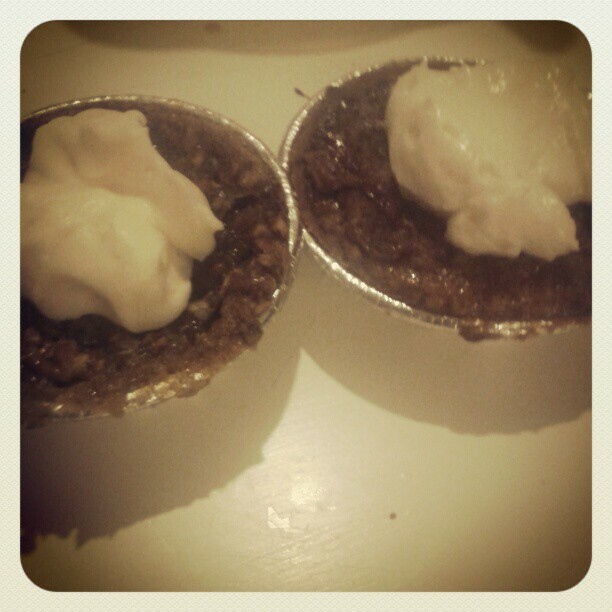 The pumpkin tart may be the find of the project. Really yummy and with the smaller size it makes for easy portion control. Always nice for thanksgiving! Sunday- This was the big day. Rubbed turkey with butter and put it in the oven before church. 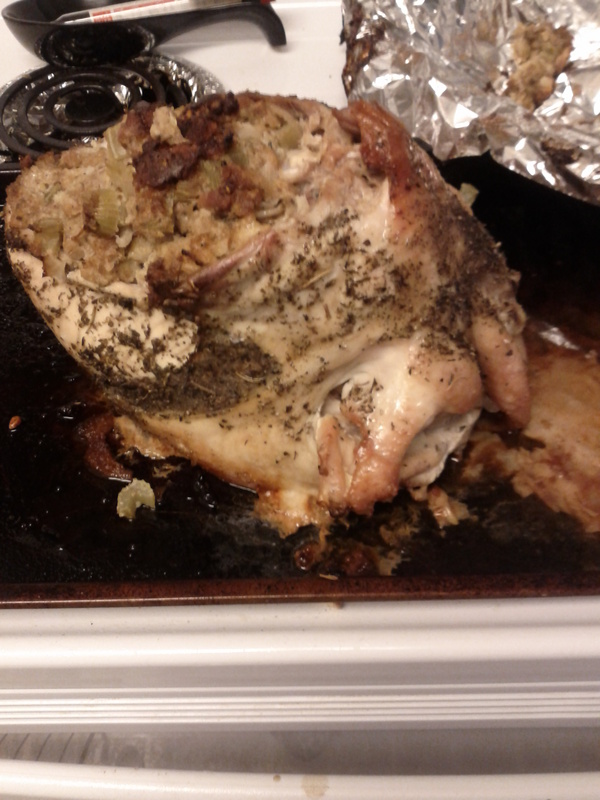 Stuffed it because I forgot to get citrus/herbs for cavity. 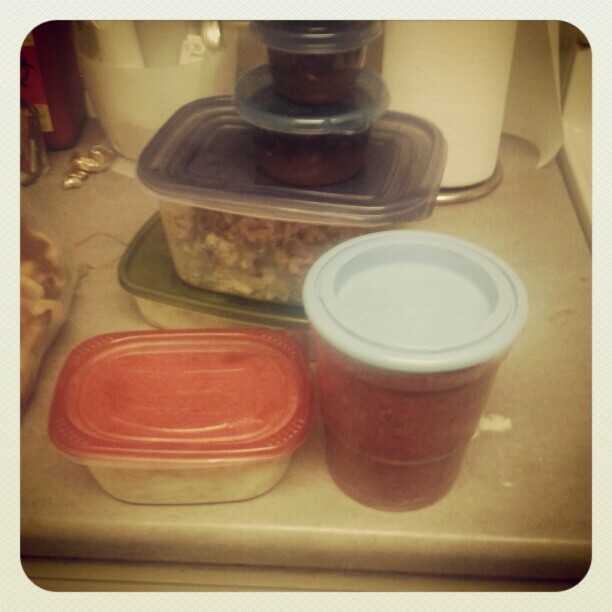 (The one thing I did make too much of was stuffing). 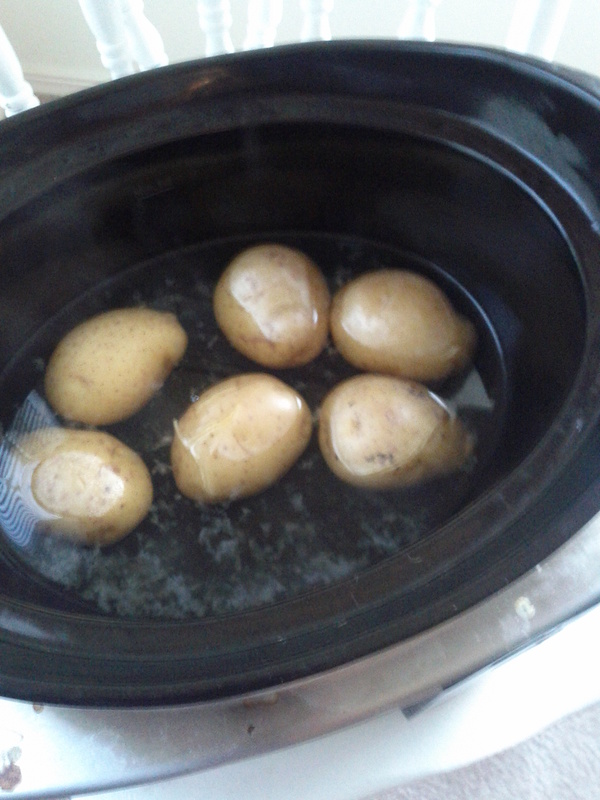 I also put the yukon golds in some water in the crockpot before church. turkey breast is smaller and I mainly like white meat anyway. yukon golds in the crockpot! Perfectly done when I came home from church! I also made the stuffing. It was a lot of fun making something different than my family would make. 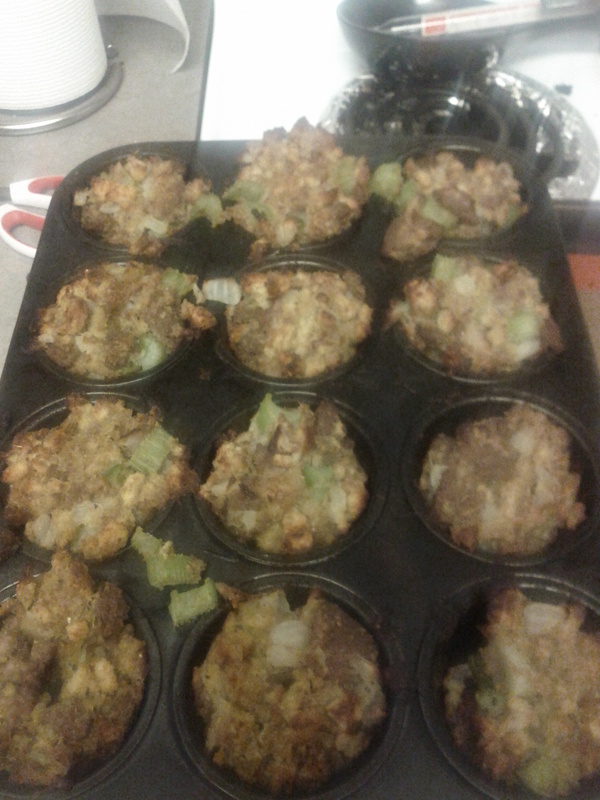 It was a cornbread stuffing with turkey sausage, celery and onion. I just used a boxed cornbread stuffing cubes but not stovetop. Cooking it in the muffin tins helps with portion control and makes it easy to freeze for cooking for one. Once I got home from church I sliced the turkey, mashed the potatoes, heated up the stuffing, made the gravy (probably hardest part! ), heated up crescent rolls from the can and made salad dressing. 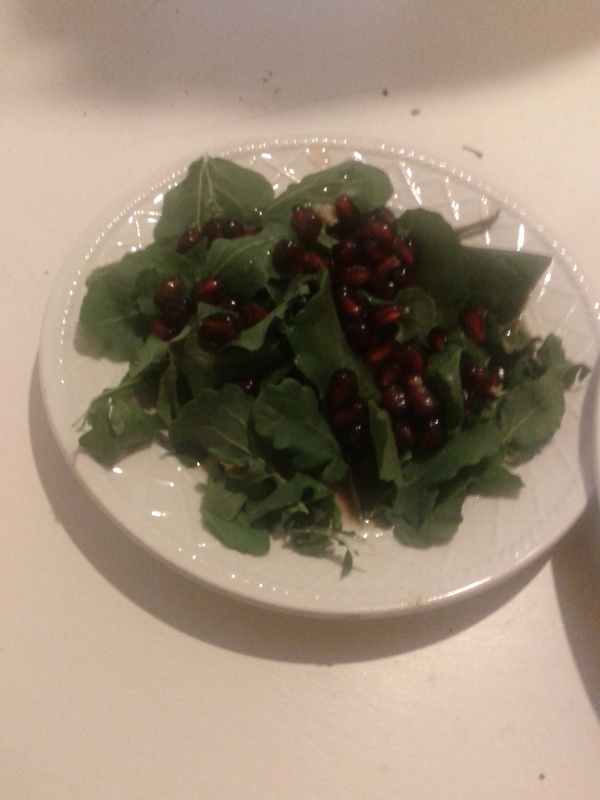 The sale was simple arugula with a pomegranate blood orange vinaigrette (blood orange juice, cider vinegar, pomegranate seeds (which kind of have a cranberry feel to me. Love them!) and agave, very simple!). The combination of the sweet, tart and spiciness of the arugula was awesome! 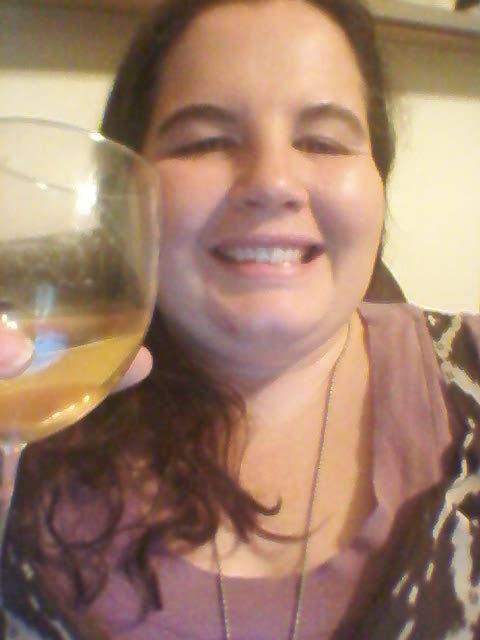 With a glass of apple cider everything was perfect! It all tasted great and I didn’t end up with tons of leftovers. I also rewashed and reused pans and other equipment along the way so I only used 1 load of dishes and it took me about 45 minutes to clean up from the whole meal. Awesome! 1. To quote the amazing Judith Jones “Some say Why would I want to go to all that trouble just for me? My answer is: If you like good food, why not HONOR YOURSELF enough to make a pleasing meal and relish every mouthful.” Cheers to me! 2. There seem to be people from a certain generation that have a hard time with spending time alone. Someone said to me this week “You went to the 5k alone”. My friend piped up and said “Rachel does lots of things alone…”. I felt proud that I am challenging stereotypes and expectations for single women. I hope I never stop! (Goodness knows I’m buying a house alone I should be able to eat thanksgiving by myself. 3. 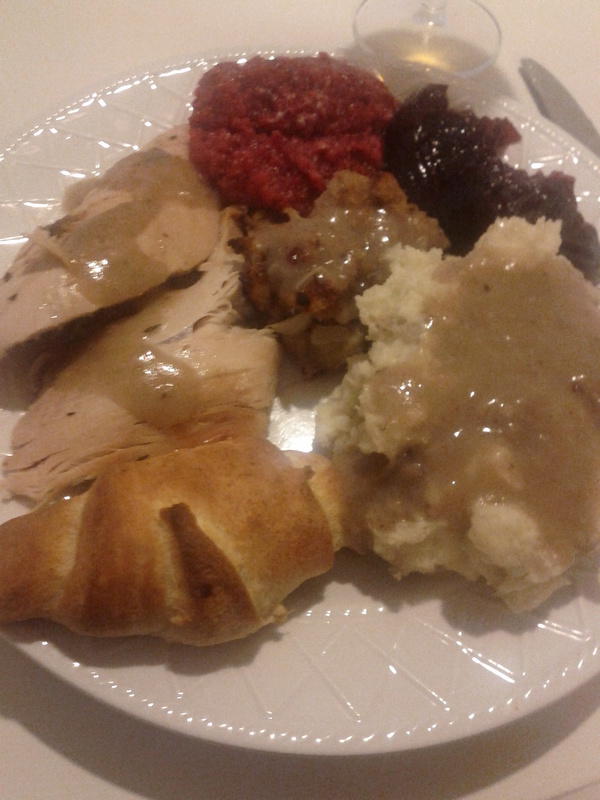 As far as the meal itself pick 2 or 3 sides to make from scratch (I chose mashed potatoes and stuffing, my favorites). The rest was more assembled like the salad or cranberries. The rolls aren’t super important so I didn’t make those from scratch. I eat sweet potatoes all the time on my diet so to me they don’t seem that special so I opted out of those. Whatever you like. 4. Then plan it out over a couple of days so that you aren’t so overwhelmed both with prepping, cooking, and most importantly cleaning! Make the dessert the day before or buy those from a good bakery (or the rolls, or whatever you have that’s quality. You could even buy the turkey and then focus your efforts on cooking sides. 5. Don’t forget little details like real whipped cream and cranberry relish. If your family always has a pickle platter have pickles. Or if you secretly hate the family jello salad don’t make it! That’s the great thing about cooking for yourself you can do whatever you want. If you want to make turkey curry go for it. Want to try sugar free recipe, go for it. Want to make collard greens or eat ham instead of turkey do it! 6. Think of phase 2 recipes for leftovers. I’m already thinking of all the way to use up leftover mashed potatoes and turkey. Cooking everything in smaller containers like the tarts or muffin tins makes them easy to freeze and eat later if you get sick of the leftovers. Come January a turkey dinner may hit just the right note! 7. Because you are cooking for 1 live a little. Buy lobster or mussels, get the good french butter or be like me and get a massage while on break! There will be plenty of your life when you are scrimping and saving every cent to pay for kids and retirement. An occasional treat for a single’s dinner is highly worth it! Plus, you can afford to go organic, get grass-fed meat, artisan bread. Whatever excites you! 8. It is a lot of work and goodness knows I too often shirk the responsibility of cooking for myself but I promise you (and need to tell myself too) that it is worth it. It is always more satisfying than the flimsy mediocre alternative. 9. I did little things throughout the meal to make it a little bit healthier. For instance, I used milk instead of cream in the potatoes. 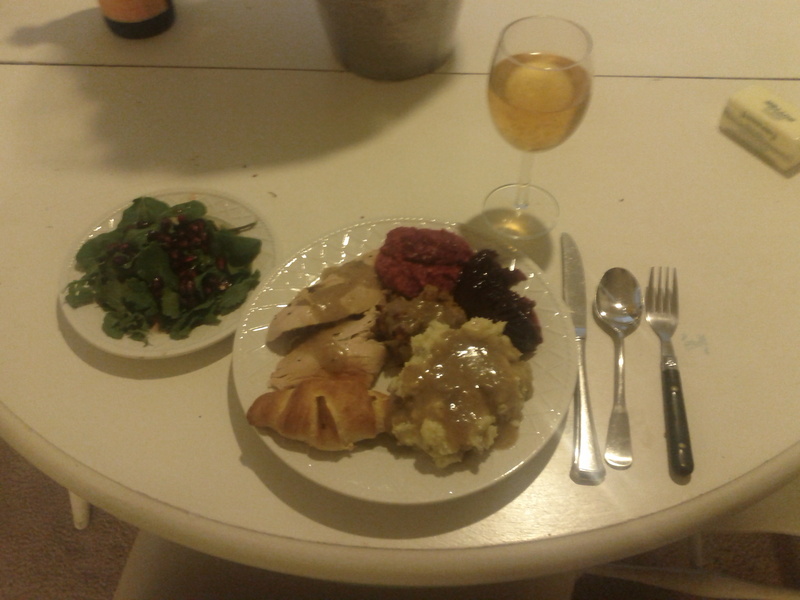 I used turkey sausage in the stuffing, the salad had no fat and used agave for sweetener, no pastry made the tarts lighter (and I think better), agave in cranberry relish and not much of it. Again, those are the kinds of individualization you can do when cooking for yourself that are hard with family that are used to things the same way. “There is something about going home at the end of the day or giving over a quiet Sunday afternoon to cooking- smashing the garlic, chopping an onion, getting all those good cooking smells going, stirring and tasting mindfully, and then adjusting the seasonings- that makes us feel creative. It is a comforting form of relaxation- something that is needed in our busy lives. I always love the moment of drama, too, when everything comes together and I quickly dish up my handiwork arranging it pleasingly on a warm plate and then take it to the table where I set a place for one with a cloth napkin in a family napkin ring. I light the candles, turn on some music and give thanks. 10. Cheers to doing one more thing on my own, even feasting! Apple cider toast. Cheers to one more milestone and a delicious meal! I’ve been trying to improve my food photography for the blog. What do you all think? I wish I would have had you over to my families house for Thanksgiving. If you are alone on Christmas you are more than welcome to come over to my house! Thanks! I’m so glad we are friends. Thank goodness for swimming. I don’t know what my Christmas plans are. Will keep you posted.